Having the perfect wedding band is just as important as having the perfect diamond. We have many styles available. Our wedding bands are organized by collections, from gold and platinum to diamond wedding rings with a variety of diamond shapes to match your choice of engagement ring. 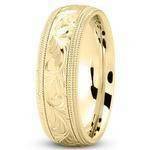 Many wedding bands can also be custom designed to fit under or around your engagement ring as a wrap for a better fit. Please feel free to choose from the most popular designs, listed below. Please note. 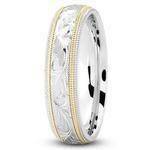 All wedding bands are custom made.